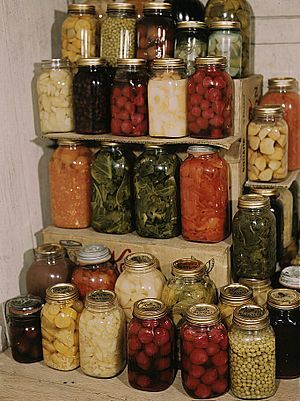 Food preservation is the name for a number of processes that help to preserve food. This means that the food treated that way will go bad (spoil from bacteria) later that if it had not been treated that way. For thousands of years, humans have used methods of preserving food, so that they can store food to eat later. The simplest methods of preserving food, such as drying strips of fish or meat in the hot sun have been used for thousands of years, and they are still used in the 2000s by indigenous peoples. The contact of the microoganisms with the food is removed, and new contact is made more difficult, or impossible. One of the ingredients of the food is highly concentrated, so microoganims cannot use it. Certain additives prevent the growth of microoganisms, or make it slower. Usually several of the techniques are combined. Heating the food or baking it (a hard corn-flour biscuit stays edible much longer than a bowl of fresh corn). Smoking the food with the smoke from burning wood. Usually, this is done to food that was salted first. Many common methods use several of these approaches at the same time. For example, pickles preserved in a jar are heated then put in a mixture of vinegar and brine. Fruit jams and jellies are heated and mixed with a large amount of sugar. 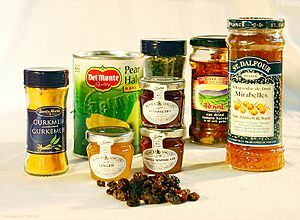 Some preserved fruit is heated and then mixed with alcohol (for example, Brandy) and a large amount of sugar. Smoked hams are cured in brine and then exposed to the smoke from burning wood chips. Bag of Prague powder #1, also known as "curing salt" or "pink salt". It is typically a combination of salt and sodium nitrite, with the pink color added to distinguish it from ordinary salt. 3D stick model of nisin. Some lactic acid bacteria manufacture nisin. It is a particularly effective preservative. Food preservation Facts for Kids. Kiddle Encyclopedia.